Biorhythm is an in-game mechanism that affects all characters on the battlefield. Depending on a character’s Biorhythm status, they may receive a bonus or penalty to Hit and Avoid. Biorhythm status is indicated by either the red or green arrow next to a character’s portrait or the sine wave in the character’s status screen. The higher the indicator, the better the Biorhythm status. Conversely, the lower the indicator, the worse the Biorhythm status. The Biorhythm status changes at the start of each chapter and as the character participates in battles (see later). If the character possesses the Tempest skill, the bonus/penalty to Hit and Avoid becomes +/- 10 instead, while it becomes +/- 2 if they possess the Serenity skill. 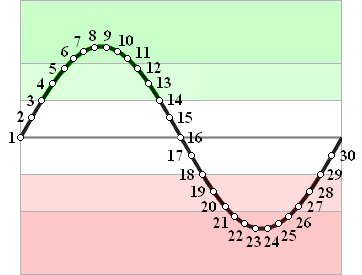 The Biorhythm status follows the sine wave that a character has, with every character possessing exactly the same type of chart. On progression of a chapter, the Biorhythm indicator moves forward (to the right) by exactly 7 points. The indicator also moves forward by 1 point for every 10 battles that the character enters (casting of Staves doesn’t count). The individual parts of Chapter 17 do not count as separate chapters for the chart progression, but the second part of Chapter 27 does. Additionally, the progression from the Final Chapter to the Trial Maps does not count as an extra chapter. For the majority of the characters, their starting point on the chart is completely random each time you load the game after resetting. The remaining characters have a fixed starting point – the indicator starts counting from the debug map (resulting in the Prologue being the second chapter in the game, internally) and until the end of the game.